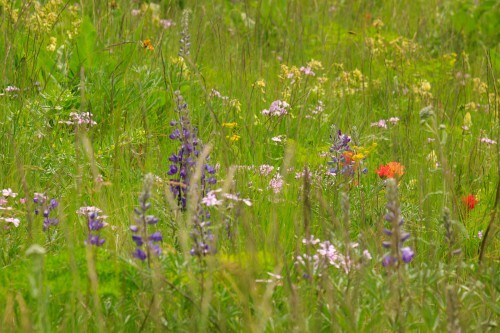 What might the native prairie have looked like? It’s hard to imagine what America’s prairies looked like when they were unspoiled. 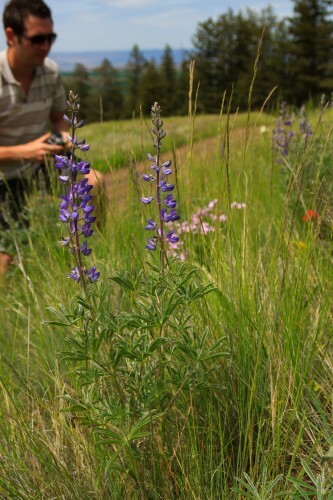 Today, more than 95% of our prairies and grasslands have been repurposed for agriculture. The last remnants are so highly fragmented that it’s a fight to keep non-native invasive species from taking over. Prairies and grasslands were once thought to be ecological wastelands, a monoculture of grass with not much productivity. From a distance, the prairie might seem like a boring place. 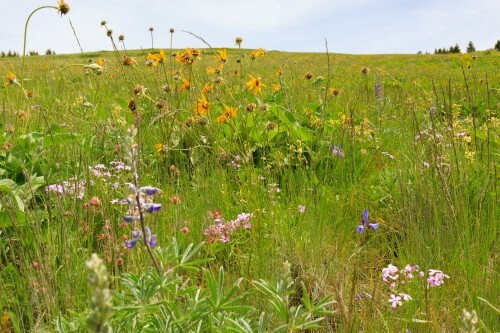 But up close, prairies have the capacity to harbor more diversity than some forests. To really appreciate all that these grasslands have to offer, it’s best to visit in the spring when the sea of green gives way to shades of blue, purple, orange, yellow, and red. And it doesn’t just stop with color. Strange shapes adorn the prairie plants. 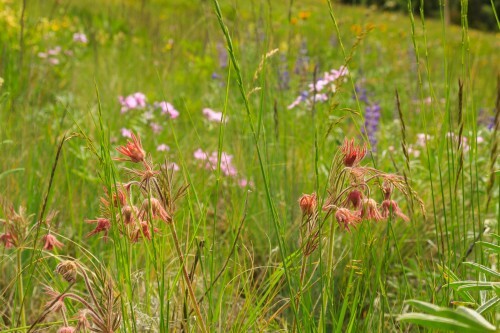 Take the Prairie Smoke (Geum triflorum) for example. This plant has one of the strangest looking flowers you’ll ever see. It’s not an easy plant to find, but I managed to come across a fairly large portion of its habitat while out geocaching on Sunday. I had discovered a cache called Broken Top a few months ago when the area was still too snowed out to visit. I figured that now might be a good time to go before the temperatures became unbearable. I also figured that this would be the peak bloom for most of the wildflowers. I was not disappointed. I picked up Wesley in Moscow and we headed down to Waha Lake for a day of exploration and geocaching. For Memorial Day weekend, Waha Lake was decidedly uncrowded. It’s a small lake in the mountains south of Lewiston. There is a small municipal park at one end that serves as a campground. There’s nothing special about it, but the camping is free and it seems like a nice place to just get away for a night. The cache “Broken Top” sits near the summit of one of the “peaks” near the lake. You could probably access it directly from the lake via ATV trails, but we opted to drive up to the Idaho Fish&Wildlife parking area. The road up to the “trailhead” is amazing. 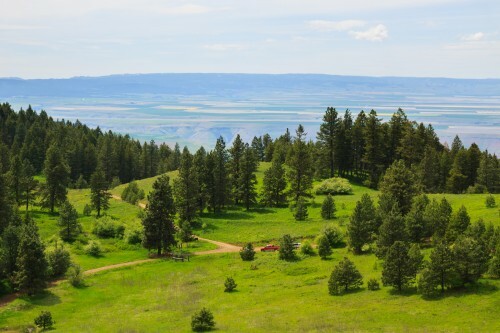 As you ascend, you can look over the Lewiston-Clarkston valley and onto the palouse. 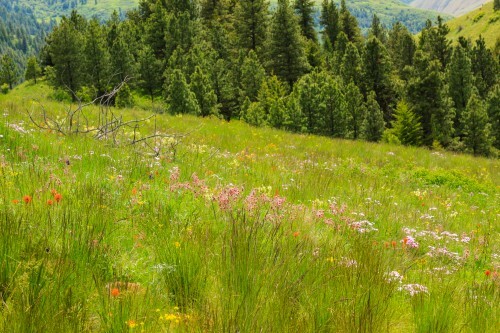 This time of year, it transverses some open meadows that are full of wildflowers. 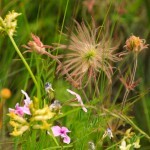 It was during one of these that I noticed the Prairie Smoke. I stopped the car and we got out to look closer. There’s no real trail to the geocache, so it was quite difficult to climb the hill without stepping on something that isn’t grass. There were so many plants in bloom that if I had stopped to identify all of them, we never would have made it to the cache. But, of the flowers I could identify, we saw Arrowleaf Balsamroot, Lupin (possibly two species), Prairie Smoke, Paintbrush (at least 2 species), Larkspur, Camas, Wild Hyacinth, Cat’s ear, some species of milk vetch. This list is in no way exhaustive, and perhaps I’ll return when I get back from vacation and create a more substantial list. The scenic views from the geocache are nothing short of spectacular. In addition to looking over the Lewiston-Clarkston valley and the Palouse, you look straight down in to the Snake River. 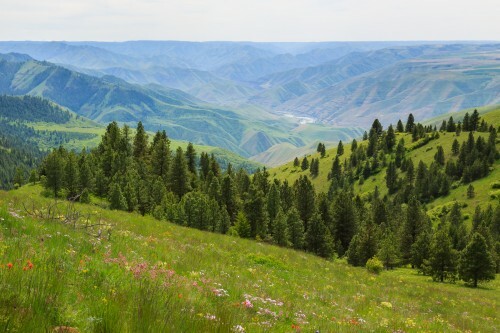 Across the canyon, the tips of the Wallowa Mountains peak up above the western rim. Wesley and I set out to hike a bit and find some geocaches. We ended up with a magical adventure. Idaho never ceases to amaze me. 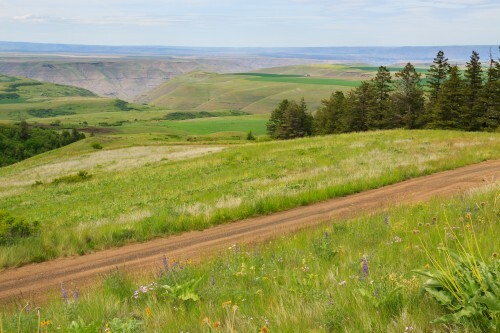 I’d like to think that the place we experienced resembles the unspoiled Palouse, though I realize that the meadows we explored weren’t completely unspoiled themselves, nor were we actually on the Palouse. But it must have been a wonderful place before it was turned into wheat fields.